The Herbert Wellness Center operates as a satellite center of the University of Miami’s Center for Research in Medical Education. The emergency cardiovascular care (ECC) courses offered by the Herbert Wellness Center are conducted in affiliation with the Red Cross. 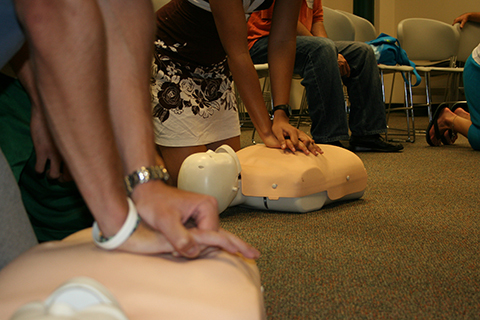 Visit our Schedules page to view the current CPR, AED, and First Aid schedule. University of Miami departments and organizations, as well as non-affiliated community groups, may request private training courses. Herbert Wellness Center instructors will work with you to find a convenient day and time; however, private training courses will be scheduled based on instructor and facility availability. A minimum of one month advanced notice should be provided to ensure instructor and course material availability. While a 6 to 1 student to instructor ratio is recommended, classes may accommodate up to 12 students at a time, but no less than 6 students. A room rental fee will be assessed for requested trainings, in addition to the course fee per participant. Private classes are not available outside of the Herbert Wellness Center. Contact Christina WooChing for more information.